Most Americans will be expecting to get a nice check from the IRS in the near future as the mad rush to file taxes ends in less than a week. After you file, there are several ways to check the status of your tax refund by visiting the IRS Web site or calling its hotline; but if you'd prefer to check it from your iPhone or iPad you can do that, too. The new MyTaxRefund app from TurboTax is a free app that will allow you to track the status of your return much like you'd track a package. The new tool only works for individuals who e-file their taxes. It only takes a few seconds to use. 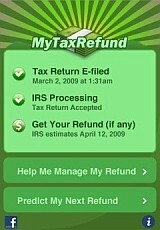 All you need to do to track the status of your tax refund from the iPhone is install the MyTaxRefund app, answer two questions and you'll have the current status of your tax refund. You don't need to file using TurboTax to track your refund status with this app. When your return was e-filed. The IRS processing status (Accepted, Rejected or Processing). When to Expect your Refund. If you're one of the 54% of Americans who expect a refund this year, the MyTaxRefund App is a free, easy way to find out when your tax refund will arrive so you can plan what to do with it. While some recipients of tax refunds are spending their money this year on something fun, (7%-12.5%, depending on who you ask,) most people are saving their money or paying down debt. If you have high interest debt, like credit card debt, the best bet would be to use MyTaxRefund to figure out when the money will arrive and prepare to make a debt reduction payment shortly thereafter.